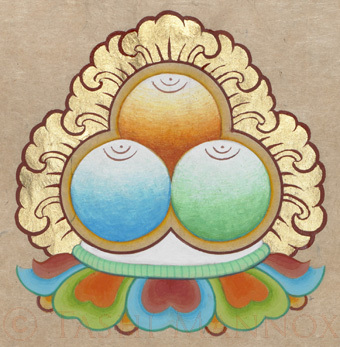 This is typically illustrated as above and at the top of the below calligraphy art piece; as three round precious jewels seated on a moon disk and multi-coloured lotus flower, the three jewels are decorated with a radiating golden leaf like pattern. To take refuge is to simply put ones trust or confidence in those who have fully liberated them selves from 'samsara' such as a Buddha, by following the Dharma teachings with the guidance of the Sangha on the path to enlightenment. Until i am free from confusion and suffering, i take refuge in the Buddha, Dharma and Sangha. "Homage to the Three Jewels" 57x84 cm ⓒ Tashi Mannox 2012. Available as a limited edition print. ~ Sanskrit Lantsa that reads namo buddha ya, namo dharma ya, namo sangha ya. 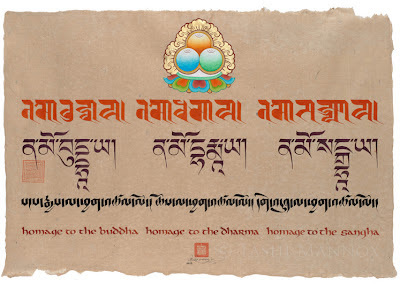 The Buddhas teachings were originally transcribed in Sanskrit belonging to India, that has evolved over the centuries into many different forms of script styles. Lantsa was a very early such style that many of the Buddhist manuscripts were created in. It was these Lantsa manuscripts that migrated into Tibet and formed the bases from which the Buddhist teachings where first translated into Tibetan. 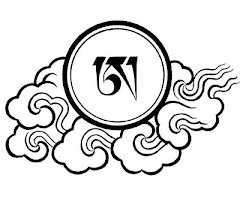 ~ Tibetan Uchen script this is a phonetic translation of the above Sanskrit that also reads as namo buddha ya, namo dharma ya, namo sangha ya. 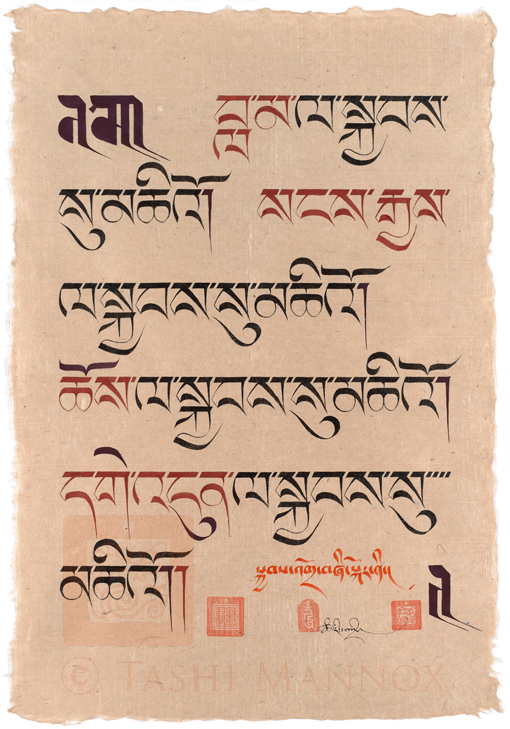 It is said that the Uchen script style was evolved to accommodate the translation of Sanskrit manuscripts from India, indeed there are some similarities in construction and letter forms, though Tibetan is a totally different language to Sanskrit, many original Sanskrit terms and mantras where maintained phonetically in Tibetan, as to preserve the original sound and to up-hold what was considered a sacred language, such as Latin is to Christians. 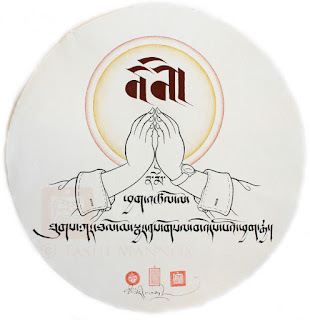 ~ Petsug script that is a translation of the above in Tibetan that reads sange la chag-sal lo, chö la chag-sal lo, gendun la chag-sal lo, meaning to bow down with folded hands to the Buddha, Dharma and Sangha. 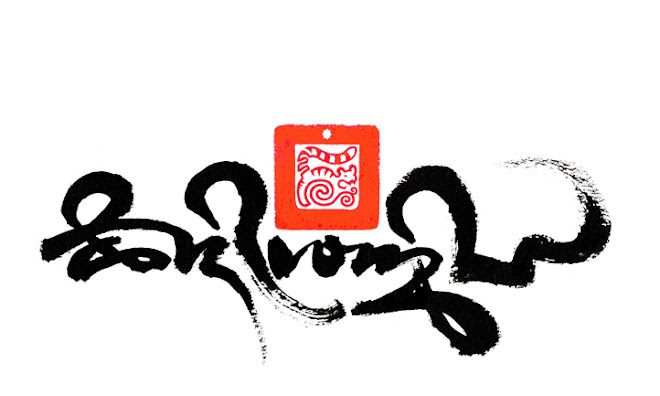 Petsug is one of many handwriting styles of Tibetan calligraphy, quicker to form than the Uchen script, it was commonly used to scribe manuscripts. ~ Celtic English script that is a translation and phonetics of the original Sanskrit. Perhaps a sacred English script; historically the great Christian manuscripts were scribed in Celtic scripts, which did not belong only to Ireland as we know it today, but the Celtic Christian influence spanned over Scotland, Wales, England and into Europe. Created for an exhibition in December 2012 at the Contemporary Calligraphy museum in Moscow. Chinese ink and Japanese mineral paint, 23.6ct gold leaf on Bhutanese tsasho paper, ⓒ Tashi Mannox 2012. "homage mudra" 48cm diameter, ⓒ Tashi Mannox 2012. 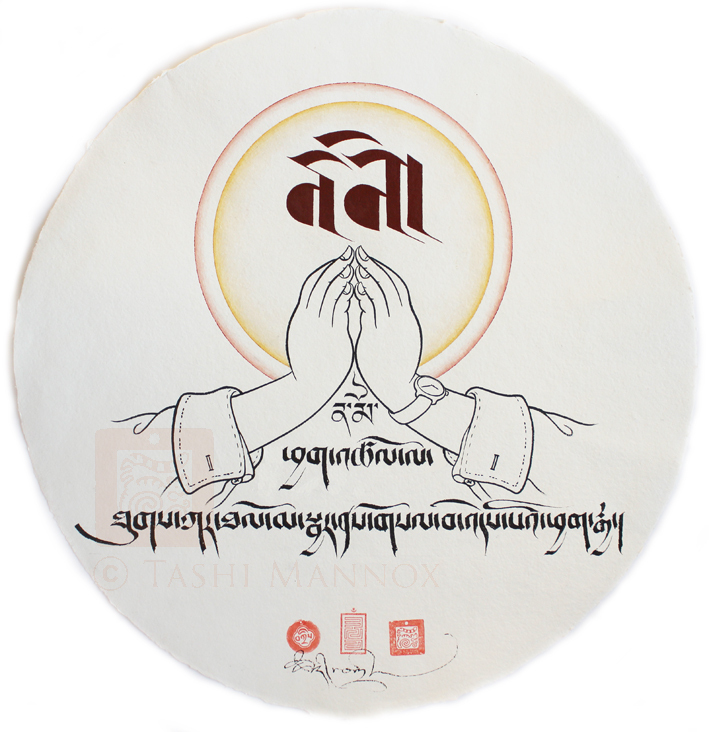 Another new piece by Tashi Mannox is to illustrate the 'mudra' of folded hands at prayer, painted in the way of traditional Thanka draftsmanship, there is a modern twist of folded back Western shirt sleeves and wrist watch on the traditional depicted arms and hands. Mudra means 'gesture' above the gesture of prayer is the word 'namo' meaning homage, this is in the Sanskrit Wartu script painted in a Japanese mineral earth red, below which in Tibetan Tsugmakhyug script translates as "hands held together at the heart in the gesture of prayer". 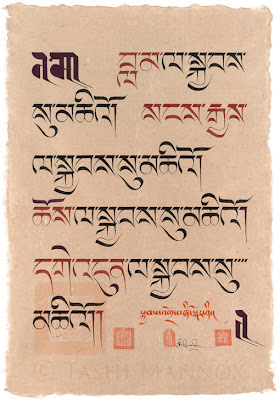 The main body of calligraphy of the above Four Refuges piece is painted in a historic 'high' form of Uchen, inspired by a 16th century manuscript from the seat monastery 'Tsurphu' of the Karmapa Lama's in central Tibet. The Four Refuges: 'Lama, Buddha, Dharma and Sangha' are highlighted in rust red mineral paint. 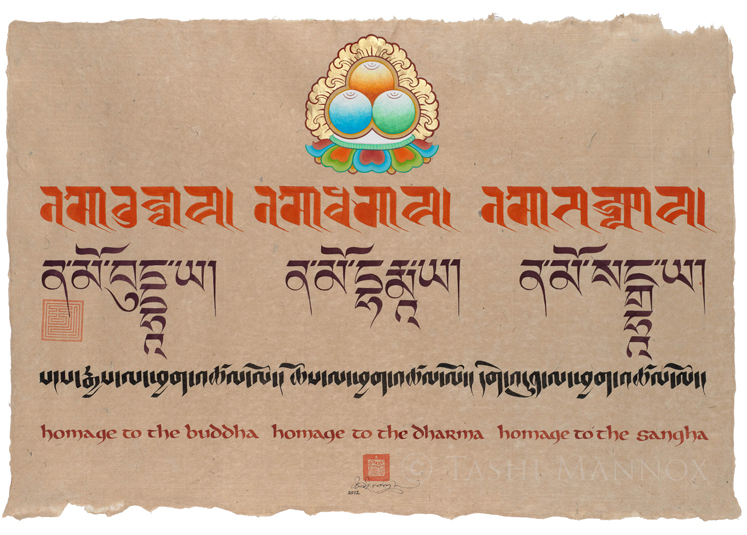 The first dark maroon characters 'na mo' in the Lantsa Sanskrit script translates as 'homage' at the end of the prayer is a 'full stop' character in the same Lantsa Sanskrit script. The smaller lettering in red also at the end of the refuge prayer, translates as "the four fold refuge"
In the Tibetan Buddhist system the Lama or Guru has become an equaled source of refuge, who a realized personal known as a 'root' teacher who has the ability to guide and point out the nature of ones mind, is called a Lama. Private collection. Chinese ink and Japanese mineral paint on Bhutanese Tsasho paper ⓒ Tashi Mannox 2012. "namo guru benza dhara Ye"